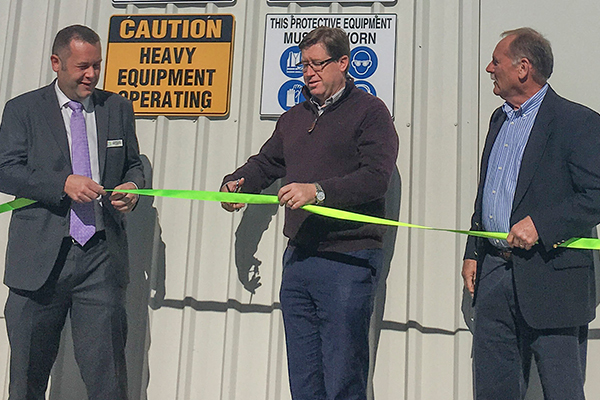 A new organics processing facility has been opened at the Whylandra Waste and Recycling Facility to recycle food and organic waste from the surrounding councils. The Dubbo Regional Organics Processing Plant (DROPP) commenced operations in early July and has begun receiving food and garden waste from Dubbo Regional Council, Mid-Western Regional Council and Narromine Shire Council. It aims to divert a significant amount of organic waste from landfill and turn it into compost, reducing environmental pollution caused by leachate and methane gas production. The facility received more than $7 million of funding from the NSW EPA, Dubbo Regional Council and JR Richards & Sons. The project was supported by the Environmental Trust as part of the NSW EPA’s Waste Less, Recycle More Organics Infrastructure initiative, funded by the waste levy. Dubbo Regional Council Mayor Ben Shields said the high-tech composting facility was built to handle organic material collected by three council as part of the new Food and Garden Waste Management service. “It is great to see neighbouring Councils working collaboratively and sharing resources to achieve a common goal,” Cr Shields said. NSW Member for Dubbo Tony Grant said the regional organics recycling will greatly reduce greenhouse gas emissions produced by landfill. “The carbon footprint of trucking the waste is minor compared to methane that would otherwise be produced by food and garden waste buried in landfill,” Mr Grant said. “This is a fantastic local initiative where organic waste from the region will be processed locally and reused locally,” he said. Image: Mayor of Dubbo Region Councillor Ben Shields, Member for Dubbo the Hon Troy Grant and Mayor of Narromine Shire Councillor Craig Davies officially opened the DROPP.